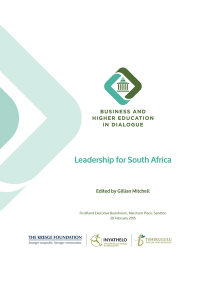 On 20 February 2015, Inyathelo organised a meeting in Johannesburg as part of a longer term initiative to create opportunities for dialogue specifically between senior leaders in the higher education and business sectors. This event, jointly hosted with Tshikululu Social Investments, explored how the two sectors relate to each other and how their different expectations and challenges can be managed. Issues were raised around the quality of graduates, the pipeline into the business sector, the role of universities in teaching and independent research, potential partnerships between the two sectors and the fault-lines that impact on the development of meaningful relationships. This report is a summary of the dialogue that took place at the event.